Everyone gets nervous when a passenger on a plane starts behaving badly these days. But what happens when that passenger is a cute little kitty who escaped her carrier and is out for a stroll through the cabin? That’s what happened on a recent Delta Air Lines flight, and one flight attendant wouldn’t stand for it. The cat somehow managed to get out of its carrier stored beneath the seat near her owner, then sneak off down the aisle. Despite the cat’s laid back, curious attitude, the flight attendant was not thrilled to see the feline out and about. She called over the intercom for the owner to claim the cat, snapping her fingers to keep the kitty from wandering toward the cockpit. 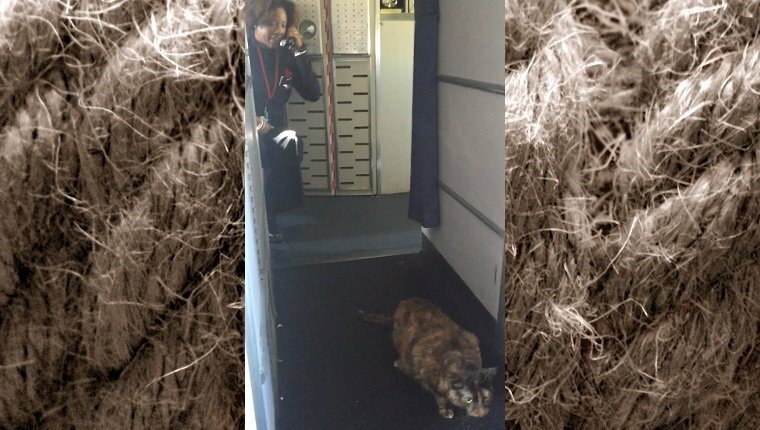 Even though the cat seemed to want to cuddle up with her, the flight attendant was nervous that the wayward feline might scratch or bite a stranger. Eventually the owner came forward and reclaimed the kitty. It is smart to approach an unfamiliar cat with caution for your own safety, as well as the safety of the cat, so the flight attendant was acting appropriately. But who knew that a wandering kitty could cause so much trouble? What do you think? Has your cat ever gotten lose from a carrier? What do you recommend for people traveling with pets? Let us know in the comments below.